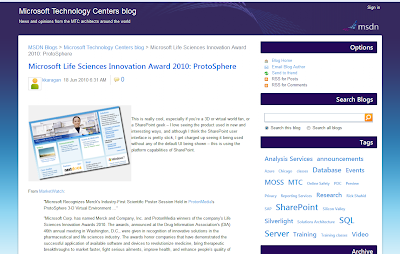 Microsoft Technical Architect and blogger Keith Karagan featured us recently on the Microsoft Technology Centers blog for winning the company's Life Sciences Innovation Award with Merck. Thought you might like to take a gander at his post for his reaction. Thanks for featuring us Keith! Join us for our ProtoSphere 1.5 open beta!